An independent family run lifestyle store and garden centre in the pretty harbour village of Birdham near Chichester, Russells can be found on the road to West Wittering beach. Alongside our extensive range of garden sundries, plants, outdoor furniture and BBQs we also have a beautiful lifestyle store, brimming with quality furniture, interior furnishings and original gifts and cards – not forgetting the biggest collection of the world-famous Jellycat plush animals you’re likely to find this side of London! Charity and community are key watchwords for us and we strive to help good causes and local organisations, in particular The Sussex Snowdrop Trust. 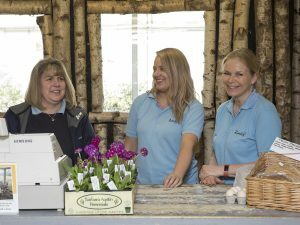 The much loved store which was established 73 years ago has grown so much since we took the reigns in 1996, with the help of our great team of staff and the encouragement and support of our customers it has been transformed from a humble nursery into a home, garden and food destination.